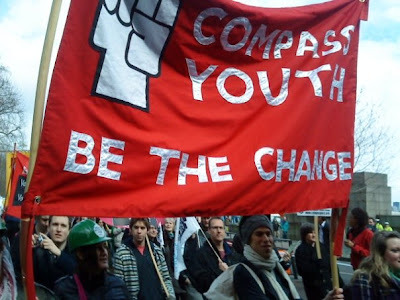 Compass Youth: NO TURNING BACK! The leaders of all three main parties want us to turn back as soon as possible to the failed ideas of the pre-crash. We think this would be a huge mistake; with this in mind Neal Lawson and John Harris have written a major essay to kick start a national debate about our country's future: Polly Toynbee wrote about this over the weekend and now we want you to join the discussion! New times demand new politics. If we don't want to turn back to the old political economy of market fundamentalism then we need a conversation with individuals and groups who want to build a better society: not just the Labour movement but NGOs, faith groups, Liberal Democrats, Greens and others - aimed not at any kind of electoral pact, but a popular movement that could shift the terms of debate and reconnect politics and real life. Both Neal and John are committed to Labour as a necessary vehicle for advancing progressive politics - but know it must be transformed and forge alliances with others if it is to bring about meaningful change. This has implications for Compass. Is this the right approach, what does it mean politically and organisationally? The truth is we don't yet have all the answers. But we want to know what you think. More than anything we want a conversation about these historic times. Please post any views you have on this news item and/or email Neal. The article suggests 10 policy ideas to ensure we don't turn back - are these right? Please add your ideas to the How to Live In The 21st Century policy competition. Crucially it is incumbent on all of us involved in Compass to organise and bring together all those who don't want to turn back to the ideas of the past: to stand up and say ‘enough is enough' it is time for something better. To start this process today we've launched a No Turning Back video (please watch it with the volume on). We think it's quite inspiring and we want you to send it to everyone you know. We need more people to be part of our No Turning Back network - so please forward the video on and at the same time urge people to join our email list. Then on Tuesday 31 March from 6pm, just a few days before the G20 summit, we've organised a No Turning Back debate in Parliament, both Neal and John will speak with Polly Toynbee chairing: we hope you can be there. Furthermore we can now announce that Saturday 13 June will be the day of our National Conference - it will be the No Turning Back event of the year. This is where the coalition for real change will come together to discuss and debate how we build a new political economy for the 21st century. Put that date in your diary now! Through the autumn of 2009 we will then be holding No Turning Back meetings and events across the UK. We want a meeting in every town and city. If you want to help organise a meeting please let us know. These are critical times for everyone involved with Compass - the windfall tax campaign and now the battle to modernise not privatise the Post Office and Royal Mail are big issues we can and must win on. Now more than ever it's time to make the case that there can be No Turning Back to the failed ideas of yesterday - we hope you'll get fully engaged in the weeks and months ahead. #G20RALLY ONLY A WEEK TO GO - WILL YOU BE THERE?